The beguiling beauty of St Michael’s Mount has enticed monks, pilgrims and artists from around the world for centuries. Accessible by foot when the tide is out, this iconic Cornish landmark lies 400 yards offshore from the historic town of Marazion - rising up like a fairytale castle from the seabed. 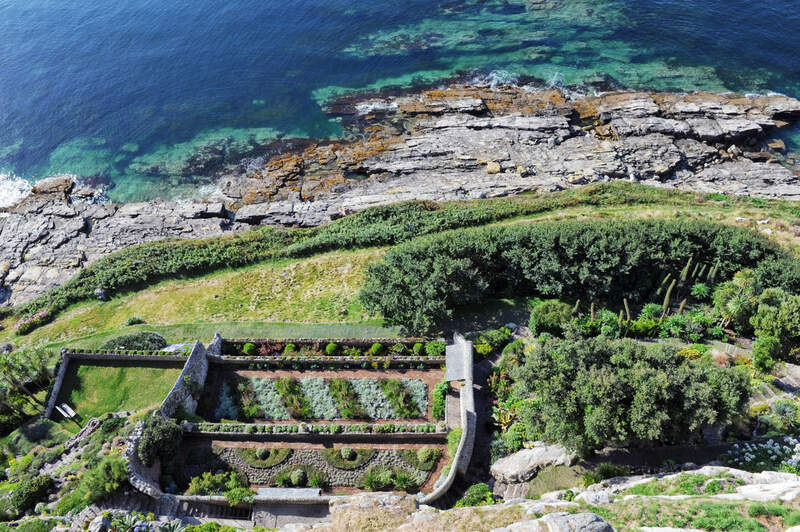 Both the National Trust and St Aubyn family work together in partnership to manage the Mount - retaining the unique legacy and island community that continues to thrive there. The St Aubyn family have lived in the castle since the 1650s and still do today – running the Mount on a day-to-day basis and opening up their extraordinary island home to the public. The National Trust - who as a result of a gift from the family in 1954 own most of the island and the causeway - are responsible for its conservation and upkeep. 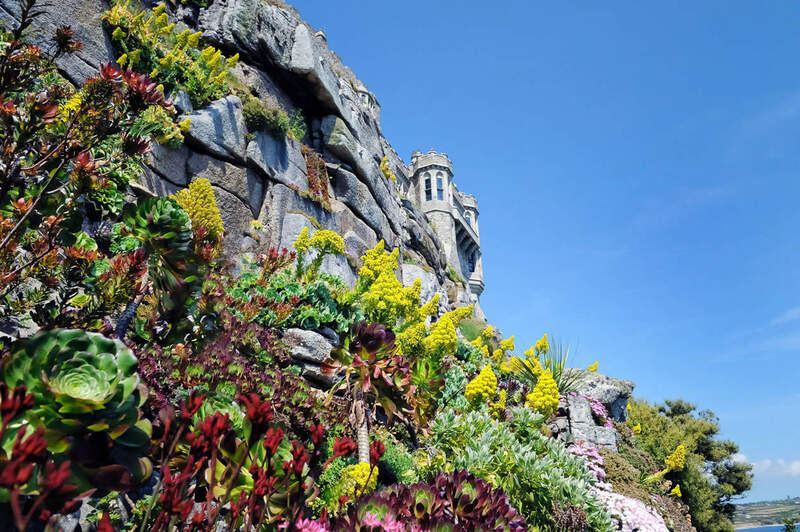 The church, castle and grounds on the Mount are alive with myth and legend – including that of the giant Cormoran who terrorised the surrounding area, before being killed by a brave Cornish lad named Jack. The tales of seafarers lured to their peril by mermaids, or those guided to safety by an apparition of St Michael - the patron saint of fisherman - has brought people of all faiths and beliefs to the island to pray, to praise and celebrate. 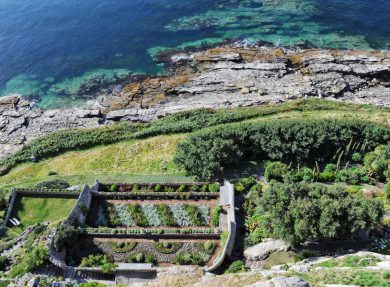 The cliff-side gardens have thrived over the centuries despite the gales and salty winds that pummel the Mount. 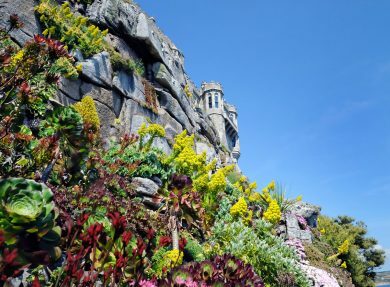 The granite rock acts as a gigantic radiator creating a unique microclimate for exotic plants to flourish. Wander through the castle grounds and be greeted by scented springtime blossoms, summertime herbs and an array of stunning colours that contrast with the deep blue of the surrounding Atlantic. If you’d like to take your own piece of the island away with you, you’ll find the plant sales area by the entrance to the garden. There’s plenty for the kids to do and explore too, including the castle quiz and garden trail. Why not get them on the hunt for the mummified cat, giant’s stone heart and the armour of a samurai warrior that are all waiting to be discovered! If you’re searching for the perfect gift or a treat to take away for yourself, a visit to the Island Shop and Courtyard Shop is a must. And when it’s time to take a break from all that exploring? We recommend heading over to the Sail Loft or Island Café where you can enjoy the variety of delicious dishes and tasty treats on offer. The Cornish name for St Michael’s Mount, Carrack Looz en Cooz’ – meaning ‘the grey rock in the wood’. On a very low tide at Mount’s Bay it is just possible to see the tree stumps of what was once an ancient forest. Finding out about the garden team’s day-to-day activities – including abseiling the 250ft cliff face to carry out extreme weeding to maintain the rocks!